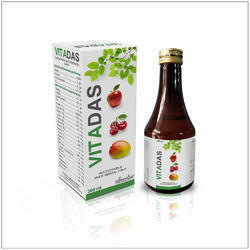 Leading 100% Export Oriented Unit of vitadas syrup, cyprodas syrup, energica 105 gm electrolyte powders, energica 105 gm ors powder, energica 210 gm electrolyte powder and gro-health tablets from Surat. 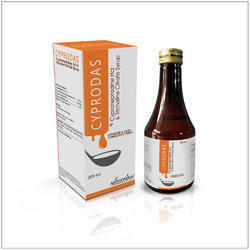 Cyprodas syrup is a medicine that is used for the treatment of occasional constipation, Liver disorders, Asthma symptoms in adults, Allergic Reaction, Seasonal Allergic, Mild and uncomplicated hives. EnerGica powder contains Carbohydrates, Protein, Fat, Dextrose monohydrate, Sucrose, Zinc Sulphate, Ascorbic acid(coated). EnerGica powder contributes to the maintenance of endurance performance during prolonged endurance exercise. EneGica powder is available in three different flavour. 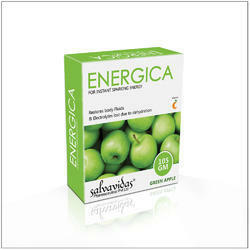 EnerGica ORS powder is used to replace fluids and minerals(such as sodium,potassium) lost due to diarrhea and vomiting. It helps prevent or treat the loss of too much body water (dehydration). Having the right amount of fluids and minerals is important for the normal functionaling of the body. 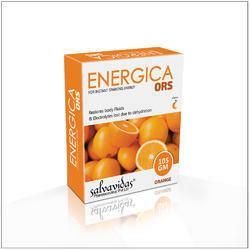 EnerGica ORS powder is available in ORANGE flavour only. EneGica 210 powder is available only in Orange flavour. 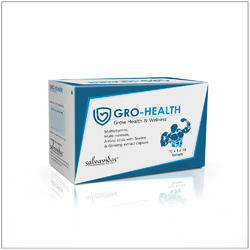 GRO-Health contains 32 nutrients with 4 super-nutrients (Ginseng, Taurine and Amino-acids:L-Phenylalanine and L-Tryptophan.GRO-Health is indicated in general Debility/ Weakness, Lethargy, Fatigue / Tiredness, Irritability , poor Immunity, Convalescence and as supplement in chronic illness.